Dish and engine solar systems are yet another way to generate energy by solar concentration. These systems use a parabolic mirror to concentrate light on the focal point where its energy can be harnessed. The mirror can be one large,smooth mirror or a number of smaller mirrors arranged as a parabola. As the name indicates, there are two parts: the parabolic shaped mirror and the receiver that collects the energy. In most of the tested designs, an engine located at the focus point generates power. Many designs use a Stirling engine at the focal point. These engines are fairly efficient closed-system engines where gas expanded by heat drives a piston. As an aside, I find it interesting that an engine designed in 1816 as a safer alternative to the steam engines of the day now finds use in modern solar systems. Rev. Robert Stirling (a minister of the Church of Scotland) invented the engine named after him with workers' safety in mind. Steam engine boilers of the day were extremely unreliable and frequently exploded, resulting in death or devastating burns for anyone who happened to be near by. Stirling engines operate at much lower pressures and have no risk of explosion. Early ones used coal or another external combustion heat source to power them. The engines were very popular for a while, but fell out of common use when improvements in steel manufacturing and boiler design made boilers safer. Today, the idea of using the sun as the heat source has revived interest in Sterling engines. However, even that idea isn’t new. 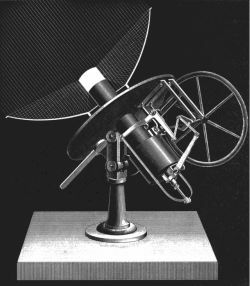 In 1872, engineer John Ericsson invented an engine using a parabolic mirror to run on solar energy. The engine was sold commercially, but using gas as the heat source, not the sun. In any case, since Stirling engines produce no exhaust and run at reasonable efficiencies they are well suited for solar applications. Contemporary engineers are picking up where the pioneers left off. Tests of these types of systems have demonstrated, to date, an efficiently of over 30%. That is, 30% of the total energy in the sunlight reaching the mirrors converts to electricity. An advantage of dish and engine concentrators is their flexibility. 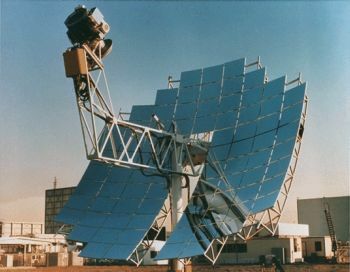 The photo above shows an array of dish and engine solar concentrators being tested at the Sandia National Laboratories. As you can easily imagine, both the size of the mirrors and the number of units in a system can be varied depending on the needs of a given situation. Additional units can be added as needed in the future. Also, the smaller size and scalability means that it may be possible to have solar engines close to their point of use rather than producing power from a central site. All in all, dish and engine solar concentrating systems are yet another exciting area of research in the alternative energy world.